After you install Schema plugin on your WordPress site, you will need to do a couple of extra steps to configure the plugin settings, this is pretty simple steps and you only got to do it once. Don’t forget to try out our Configuration Wizard, which will simplify setting up the plugin. 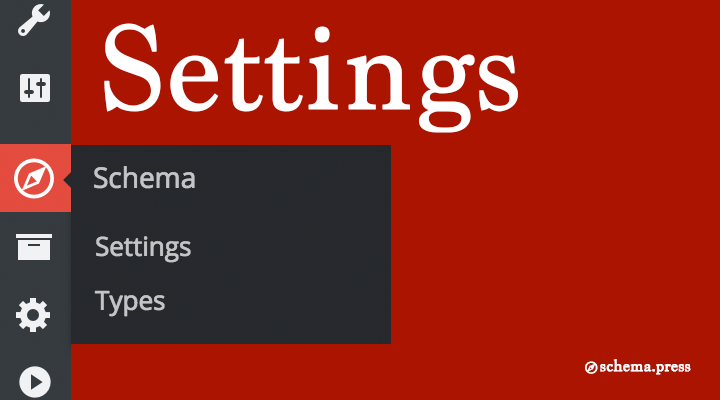 You can navigate to Schema plugin settings page within the WordPress dashboard admin menu. If the plugin is active, you should see new menu item called Schema. When you click on the Schema menu item, you will be directed to the settings page. Feel free to fill the required settings fields with correct and valid values to enable the schema.org markups on your site. Schema settings gives you control over different functions and outputs of the plugin, below you can view screenshots of settings pages. Most of these settings are simple and easy to configure.